Series Name: Man From S.U.N.D.A.Y. Charles Rand is an agent with S.U.N.D.A.Y. Technically it should just be the first five letters since its name is Special United Nations Defence Agents but then they add the qualifier of Y Section and there you have the full name. The Y Section has an asterisk which the footnotes indicates means The Section of Men Licensed To Kill. We know very little about Rand for two reasons. The first is that there is only one (comic) book released with his adventures. The second is that I do not have nor have I ever held a copy so other than the data we can glean from cover, we know nothing more. What we can discern is that he is S.U.N.D.A.Y. 's best agent, shown by the qualifier of "The Number One Man". We know he is a man of action and has apparent skills in hand-to-hand combat considering the way that he is flying at his opponent feet first with one pedal colliding with the man's face and the other one possibly ready to strike the bread-basket (or lower). From his comment about "putting my best foot forward" we can see that he is not above a bit of humor in his work, especially at the expense of his adversary. That he can mouth this pithy line while in the middle of his assault speaks to his conditioning as well. One additional obvious fact about Rand is his rugged good looks and his blond hair, which is worn in a rather longish (for that time) style despite his normal (again for the era) dress of a dark suit and tie. Note: should ANYONE have anything to add about this series, please let me know and if you happen to have a copy you would not mind sharing for a brief read, even better! The Dutch images were taken from Catawiki. 1st of 4 stories in the single issue comic adventures of Charles Rand - (16 pages) - The infamous Association of Barmen are planning a major operation and Charles Rand is sent to the coast of Spain to leap into action to stop them. 2nd of 4 stories in the single issue comic adventures of Charles Rand - (16 pages) - [plot unknown]. 3rd of 4 stories in the single issue comic adventures of Charles Rand - (16 pages) - [plot unknown]. 4th of 4 stories in the single issue comic adventures of Charles Rand - (16 pages) - Mr. Pensacola is a U.N. envoy heading to Jahanpur, India, for the signing of a treaty but there are those who do not want it signed. Giving my opinion on a series I've never read more than the front cover is silly so I will try nevertheless! Of course I have no real comments on it other than it is a shame that no more than one issue was written but at least we have (or would have if I owned a copy) four different adventures in that solo output. 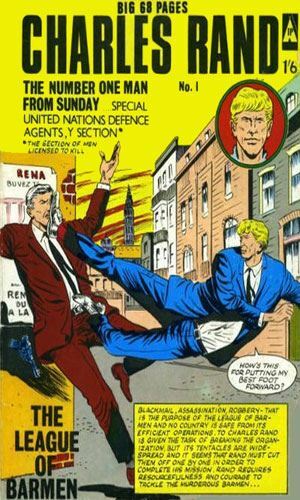 Thorne & Porter were known to me before this series for having published a few "annuals" about other popular series - most notably the Avengers and Danger Man. They also did this single issue of what I am sure they hoped to be a series. 2102, 2105, and 2107. Interspersed with these were Danger Man and Avenger adventures among others. The inclusion of Charles Rand in a "TV Classic" series is a tad odd since there was no show about it.